If you’re listening, the first thing that strikes you when you arrive at the theatre for Let It Be, the new musical show featuring 20 Beatles hits, is the number of languages being spoken around you. A large portrait of the Fab Four in rainbow, Sgt. Pepper regalia, made of 15,000 multi-coloured jelly beans in decidedly un-sixties flavours like latte and Pina-Colada graces the stalls bar, where a myriad of people from around the world snap photos of it. Anticipation is high, as two eastern Europeans, at a loss for words, gesture to two empty chairs at our table. We nod, they sit, and the house opens. When the show starts, we’re instantly struck by its’ accompanying film footage, of hysterical fans literally climbing the walls in London, then, New York. What’s on stage seems secondary to that unbelievable reality, until our ears latch onto some memorable sounds. It seems as though John, Paul, George and, Ringo have come together for that concert we always dreamed of, that was sadly, never to be. The musicians performing the songs are note and word perfect and the memories flood in, ones from their earlier days, all happy. The Beatles eagerly anticipated first appearance on US TV on the Ed Sullivan Show, Feb. 11, 1964, offered much needed cheer in the aftermath of JFK’s brutal assassination, and it’s faithfully re-enacted here. 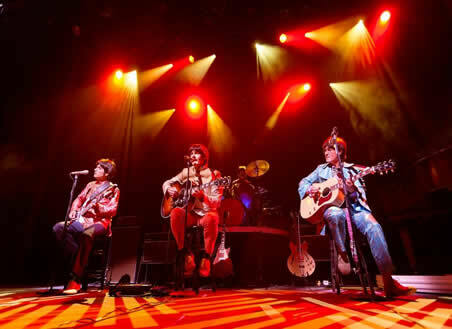 Onstage musical trips down memory lane tend to inspire such recollections, especially for those who ‘grew up’ with The Beatles. The talented actor/musicians playing the group have definitely done their homework, as every head tilt, guitar dip and gesture is in synch with recorded history. For the first few songs, I’m swept away by the accuracy of their sound, though physical resemblances are, admittedly, slight. By iconic ‘I Want to Hold Your Hand,’ my eyes notice the background – a grey toned montage of the Cavern Club, Penny Lane street sign, and lit up row houses of Liverpool cleverly reminding us that this show is a celebration of the group. ‘This Boy,’ with its sentimentality and longing makes me briefly nostalgic for my gangly days. It strikes me that the fellow playing Lennon has him down pat. The Beatles ‘conquering’ of America is shown onstage, in synch with the ‘lads’ intermittently projected onscreen in ‘64’ garb, it’s a clever manoeuvre, though it makes us long for the real thing. ‘A Hard Day’s Night,’ atypically perfect, makes me remember The Beatles cartoon show I used to watch, a major reason why most US Baby Boomers know all the words to Beatles songs. Though, as ‘Mc Cartney’ slips into ‘Can’t Buy Me Love,’ I feel annoyed that the somewhat wooden audience has yet to acknowledge the fact that these guys are really playing and singing - live! The real test for anyone being Mc Cartney, ‘Yesterday’ draws cheers, though the performer’s feigned Liverpool accent doesn’t convince. ‘John’s’ is much better. The mayhem of Shea Stadium - 15 Aug ’65 plays onscreen as the real Mc Cartney comments, ‘Seemed like millions of people, but we were ready for it’. It’s a toss-up as to whether we should watch the stage or the footage, it’s that amazing. ‘Day Tripper’ wakes a few people up, as onscreen girls break away and make a run for their idols. While the stage is being prepared for the next transition, we’re treated to vintage adverts for ‘007’ aftershave, ‘Gluv’ the man-made suede, and one I recognised, albeit with a US accent dubbed in - ‘Prell’ the shampoo with lather so thick you can make a hair do out of it. Icing on the cake is provided by ‘Capstan’, fags so enticing a bride and groom can’t wait to get their ‘I Do’s’ out of the way to light up! Twiggy, whose boyish frame made me stylish in the day smiles down on us, as flashes of Mary Quant, the 66’ World Cup win, and other iconic people and moments revive memories. America’s abiding hippie hangover manifests itself via ‘Crimson and Clover’ by Tommy James and the Shandells, baby stuff compared to first UK (in the US) psychedelic hit, ‘The Sunshine of Your Love,’ by Cream, featuring Eric Clapton. 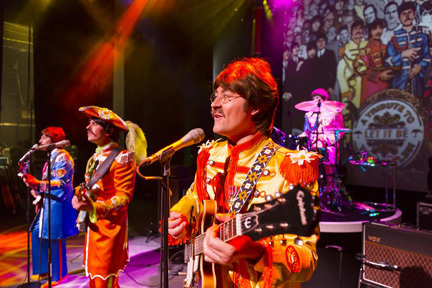 The group returns as and, with Sergeant Pepper’s Lonely Heart’s Club Band, the album that divided Beatles fans, and largely delighted critics. One of the beauties of this show is the way it enables you to see the mechanisms of a song, i.e. John and Paul’s call and response to Ringo on ‘Yellow Submarine’. The animations on these segments are somewhat in keeping with the songs times, though shoes shown on one of them are more retro punk, than yesterday. ‘Paul’ is well warmed up by now and sings ‘Eleanor Rigby’ much better than Mc Cartney himself would now be capable of. There’s just enough variance between the recordings of the songs and the way they’re performed to give them a ‘live’ feel. When ‘Lucy in the Sky with Diamonds,’ hits, they’re on my home turf, so to speak, and though projections are a tad more advanced than in the day, they’re still low-key enough to reactivate memories. It may just be me, projecting, but there’s a sense that we’re just ‘getting through’ this Beatles phase. On the line, ‘I’d Love to Turn You On,’ I note that Lennon takes the slow parts, Mc Cartney – more upbeat ones. I can’t help but appreciate the increasingly, sometimes amazingly, complex lyrics, apparent on ‘A Day in the Life,’ and other later hits, as well as Lennon’s irony on lines like, ‘Now I know how many holes it takes to fill the Albert Hall.’ ‘When I’m 64’ becomes an enjoyable sing-along here. 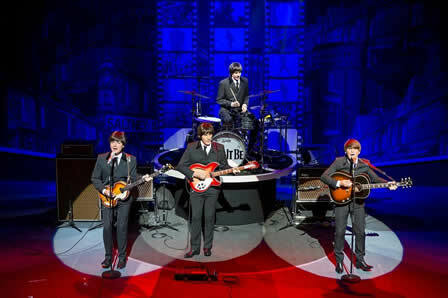 The cast is able to do something the real Beatles never could – get through a live show and hear themselves. A pause in the action brings Hendrix’s ‘Purple Haze’ and Donovan’s ‘Mellow Yellow’. Mc Cartney’s voice notes, ‘Maybe it was called the Summer of Love, but it was golden.’ Most of the fans in the audience we were in seemed to know every nuance of the ensuing records, which the onstage group effectively recreates. With facial hair, ‘George’ is a better likeness and his mannerisms and speech aptly Harrison. ‘Strawberry Fields’, recently voted favourite Beatles song, gives pause, but no matter how well performed here, is not as Lennon would have sung it; though it’s great that the actual surreal mix at the end is included. One of the things which made The Beatles real stars is that no one can duplicate their exact sound. Still, it’s inadvertently revealing to see normally conservative people, grooving along in public, unwittingly nodding to their hippie days via their seemingly, spontaneous responses. The gulfs between song styles demonstrate the Beatles ongoing diversity and continual ability to surprise their listeners. An unplugged session between John, Paul and George down front further illustrates this point, lending a bittersweet longing for the concert that never was, as haunting Rubber Soul ballad ‘In My Life,’ slips easily into Abbey Road with ‘Here Comes the Sun’, the recording of which has been listened to by a staggering 35 million plus on You Tube (a record). Onstage ‘John’ looks more like The Lovin’ Spoonful’s front man John Sebastian, but his voice is incredibly Lennon like. 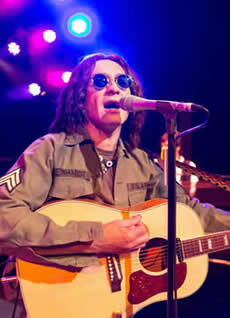 ‘While My Guitar Gently Weeps’, as sung by ‘George’ with great sensitivity is genuinely moving. During another brief pause, bombs drops on Vietnam onscreen and Hendrix sings ‘All Along the Watchtower,’ after which we rapidly move between Hair and ‘Age of Aquarius’, amid scenes of face-painting, bubble blowing, pot smoking and Moon Landing, after which the group ‘Come(s) Together’ on Abbey Road. By this time, they’re all dressed differently, as our minds ‘Get Back’ to the real, ever changing Beatles. ‘Revolution’ confirms here, as it did then, that The Beatles were still, a great rock band, by then, more obviously with their own, individual grooves. ‘Give Peace a Chance’, adopted as a U.S. and world-wide anti-war anthem in 1969 confirms music is and could be the ultimate weapon, as does the encore, ‘Hey Jude’ which inspires everybody, of all ages, to come together and join in. Thanks to Ian B. Garcia (George Harrison), Phil Martin (Ringo Starr), Emanuele Angeletti, (Paul Mc Cartney) and Michael Gagliano (John Lennon) for enabling this Beatles celebration, in synch with the 50th Anniversary of the release of their first single, ‘Love Me Do’ (Oct. 5, 1962) the night we were at the Prince of Wales, where The Beatles performed as part of the Royal Variety Performance on Nov. 4, 1963. Grateful thanks to The Beatles themselves, (RIP John and George) for their invaluable and timeless musical legacy and perhaps most importantly of all, being true, one off originals.